It occurs to me that high school is the denouement of back-to-school shopping. Or maybe it is the eye of the storm between kindergarten and college. Mostly, because it’s so boring. This year, back-to-school shopping for my high school students has been less than fun. And no matter where we go, it’s all the same stuff. I’ve bought enough jeans to clothe the entire male population of Bolivia. Half of these jeans look as if they have been worn BY the male population of Bolivia every day for all 378 days of the World Cup. The other half looks as if they have been dipped in the vat of dye that changed forever the color of the Joker’s hair. Everything else is black. Or blue. To match, one can only assume, my kids’ moods. Where are the dress shirts and the kicky sweaters that got pulled out for the first day of school and on picture day? Which, of course, is also where their underwear is. Every time I ask if they need new ones, they mumble and shrug, leaving me to believe that all the good underwear I bought them last year has been traded to the Bolivians for pairs that show more wear and tear. Ditto their socks. Come to think of it, maybe the Bolivians are to blame for our recent spoon shortage as well. Gone are the long discussions where my sons and I anxiously decided between Iron Man or Bakugan for the perfect backpack personality for the new school year. Gone are the smells of a brand new Trapper Keeper, or the never before opened box of 64 Crayola crayons – complete with silver, gold and bronze. Gone are the walks down the aisles of Kmart, buying matching Granimals and Underoos. Now, instead, I buy notebooks, dry erase markers, loose-leaf graph paper and 3-ring binders. 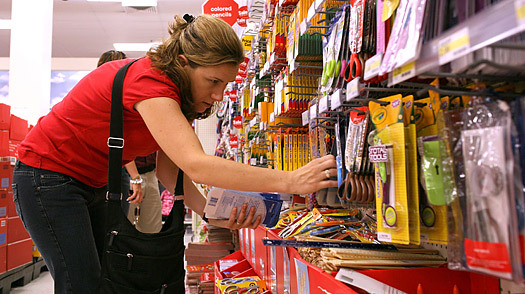 I used to look forward to back-to-school shopping as a kid. The new backpacks, the new lunch boxes, the loose leaf paper and crisp sharpened pencils – it’s like you get to go crazy at Office Depot! And the clothes! Oh, my GOD, don’t get me started. When I was a little girl, each August meant two new pairs of jeans, one dressy outfit, a new pair of Nikes, at least three or four new shirts, and a smattering of really cool skirts that would spend more time on my closet floor than on my hips, but that came straight out of the pages of Seventeen, so I knew I would look good whenever I got around to wearing them. God, I loved those go go boots… is it okay for a middle aged woman to wear short skirts, sweater vests and go go boots still? 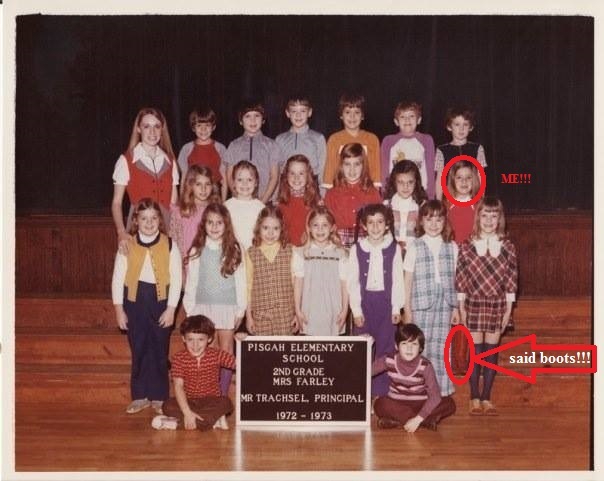 One year, I got a red plaid school lunch box with matching Thermos, that matched two of my new outfits in red and black. I even had red, shiny go go boots to go with them, which was WAY cooler than the year before’s purple corduroys and purple turtleneck body suit that SO did not match my Jonathan Livingston Seagull lunch box. “Thanks, Mom! I love them!” I said, flinging my arms around my mother’s neck. It really was much easier to please me back then. In years past, I even looked forward to buying all the things my kids would need to be stellar students. One year, their back-to-school supply list included, along with the regular paper, pens and pencils – one ZipLock gallon freezer bag, one box of Kleenex, one bottle of anti-bacterial liquid and one bag of candy. The boys used to get a kick out of picking out their candy, their favorite colored folders and their new pencils with their almost sharp enough to be deadly tips. This year’s list included: one artist’s sketch pad, one Pearl eraser (pink), two TI-83 calculators (cost $140 per), four packs of index cards (that I can guarantee you will never be used), post-it note pads and a different 3-ring binder for every subject. Not one mention of a Trapper Keeper anywhere! This past week, I bought what we needed in terms of pens, and pencils, and paper. Whatever. Seriously, how much paper do teachers think that two teenagers are going to go through in a school year? I’ve bought enough paper to keep my office in business for half a year, and we’ve got seven people in there! 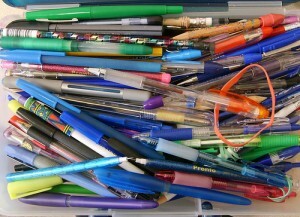 I’ve bought enough blue and black pens to write “I will not chew gum in school” for my junior high school teacher Ms. Ford seven BILLION times – which coincidentally, is roughly double what I wrote for her when I was actually in her class. It’s just not fair. It’s like this let down after years of detailed lists and character stuff that forever reminded me that they were kids. Where’s the fun in buying warehouse store quantities of office supplies? Where’s the challenge? Where’s the creativity? Maybe it’s the fact that they are in high school. Maybe it’s the fact that they’re not “kids” anymore. Maybe it’s just another fact of being a mom to boys. But there’s no getting over the fact that it’s boring.